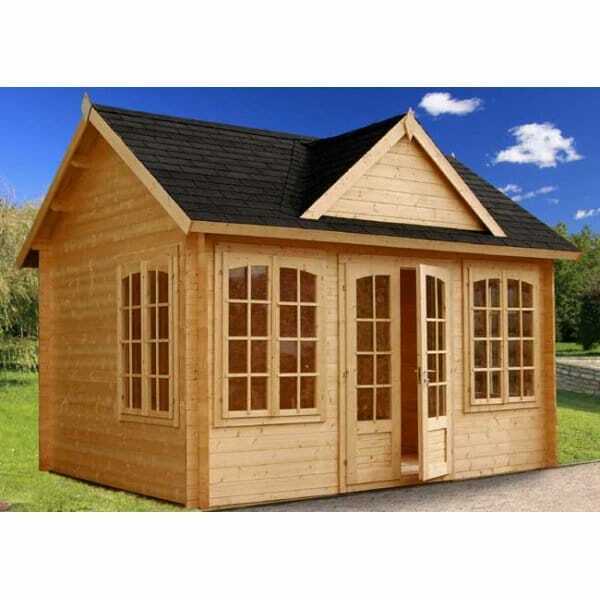 The Palmako Claudia 11.5m/sq Log Cabin is a very attractive and spacious garden log cabin style summerhouse which is a perfect garden retreat to relax, entertain or work. The superb construction and design means that this garden building is an ideal central feature in the garden or simply a discreet summerhouse in the corner! Exclusive to Garden Chic. The summer house can be supplied with optional Bituminous Felt (Shed Felt) roofing or Bitumen Felt Shingles in a choice of either Green or Black. Please note; if shingle option is chosen the shingles supplied are Square Ended. If the summer house is to be assembled in a restricted space; there should be an allowance made for roof overhang to the both sides and rear of the building of 30cm roof overhang. Showing 2 of our total 3 reviews, with an average rating of 5 stars. Read all 3 reviews for Palmako Claudia 11.5m/sq Log Cabin. Review - My husband and I are extremely pleased with our new Garden House and we built it without any problems. It is such good quality and looks great in our garden. Thank you to Garden Chic for all their help and guidance. My husband and I are extremely pleased with our new Garden House and we built it without any problems. It is such good quality and looks great in our garden. Thank you to Garden Chic for all their help and guidance.